Panopto – Which link is which? 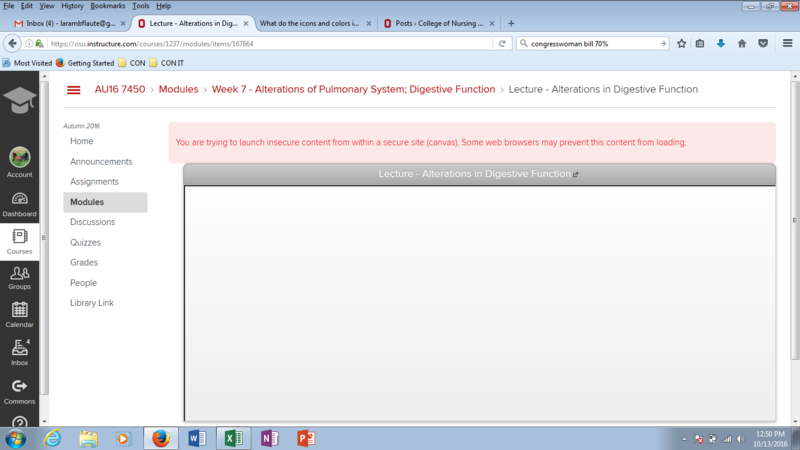 If you are an instructor and you receive any Panopto “ready to view” emails, you might be wondering which link is which. Long story short, choose the “View” link. We suggest you actually click on it, make sure it plays fine, and then copy the link from the web browser instead of your email. Otherwise, here is a breakdown of an example “ready to view” message. View: This is the link you want to share with students! We suggest you click on it to make sure it works properly. Then copy this link from your web browser and paste it into Canvas (or an email or however you want to share it with others). Edit: If you know how to make some basic edits to your lecture, this link will take you to the Panopto website. You’ll need to log in if you aren’t already. Share: Please do not confuse this with the View link! 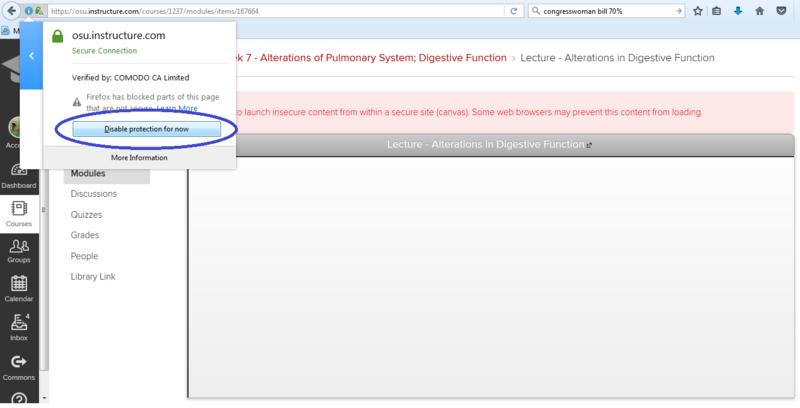 This allows you to check the sharing settings on your lecture. Additional output formats: You will likely not use this, but if you do, you get different options on the ways your lecture can be viewed. These options are mainly for video and audio podcast versions. 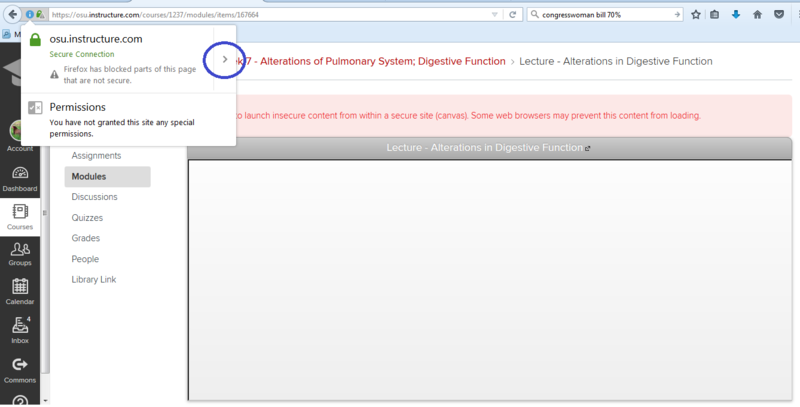 When scrolling through your Canvas course you may have noticed that some links (to Panopto recordings, OSU websites, or outside websites) will show a preview on the page, and some will instead show a warning of “insecure content” and no preview. The warning appears in red text in the screen shot below. Generally, these links are safe to follow, but always exercise your best judgment when you receive a warning such as this. The Instructure Guide to Canvas has a page explaining this phenomenon and several others issues that may arise depending on the browser you are using to access Canvas. That guide is here: Which Browsers does Canvas Support? For those who use Firefox, here are a few quick tips so you or your students can still access this content. When the insecure content warning comes up, you can view the link in a new tab by simply left-clicking on the link (circled in green here). This is the easiest solution. 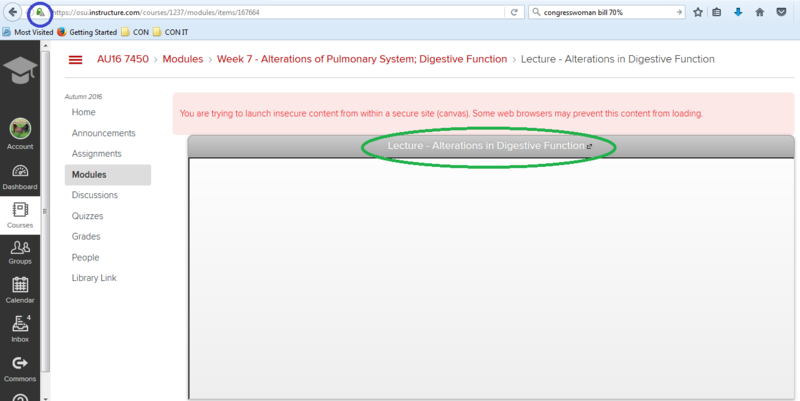 If you want to view the link within the Canvas page, click on the padlock icon in the address box (circled in blue). Next, click “disable protection for now”. This should allow the video (or webpage) to load in the box below the link. If you are accessing Canvas through another browser, such as Google Chrome, see the link above that will help you troubleshoot issues. As always, feel free to contact us if you have specific questions! 1. 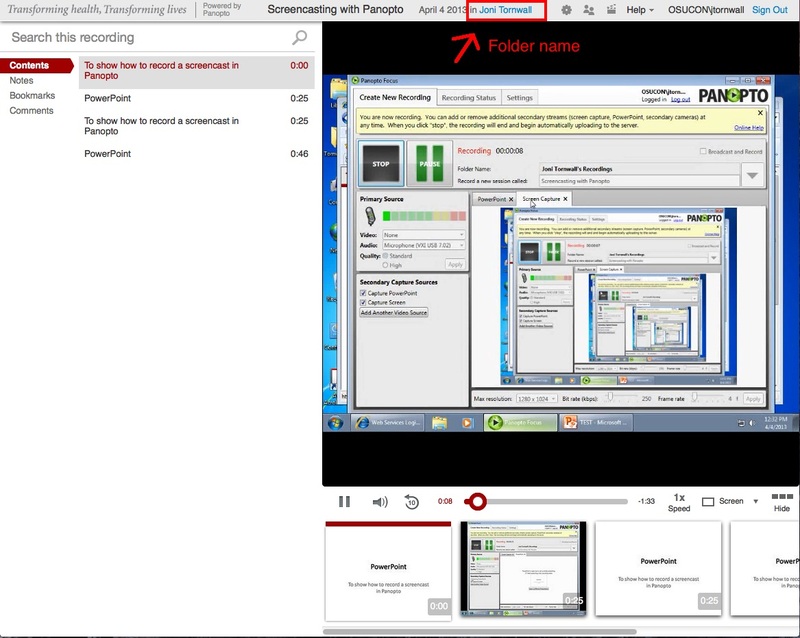 Enter the folder in Panopto that contains the recordings of interest. If the direct link to the folder is not available, the folder can be entered from a single recording. See the illustration below. 2. 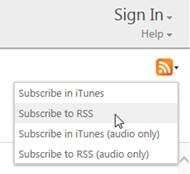 Subscribe by clicking on the orange RSS icon and choosing one of the options (audio only, full presentation, RSS, or iTunes). Note: We suggest using Firefox or Internet Explorer. The RSS portion of these instructions may not work properly in Chrome or Safari. 1) Go to the Panopto lecture in question. 2) Click on the name of the folder where it’s located. This is listed on the top of the lecture. 3) The folder should open in a new tab. If the playback in the other tab annoys you, you’ll want to go back and pause it or just close that particular tab. 4) On the top right of the list of items under the Sign In link is an RSS feed icon. Click on it and choose Subscribe to RSS if you want video or Subscribe to RSS (audio only) if you want just the audio. 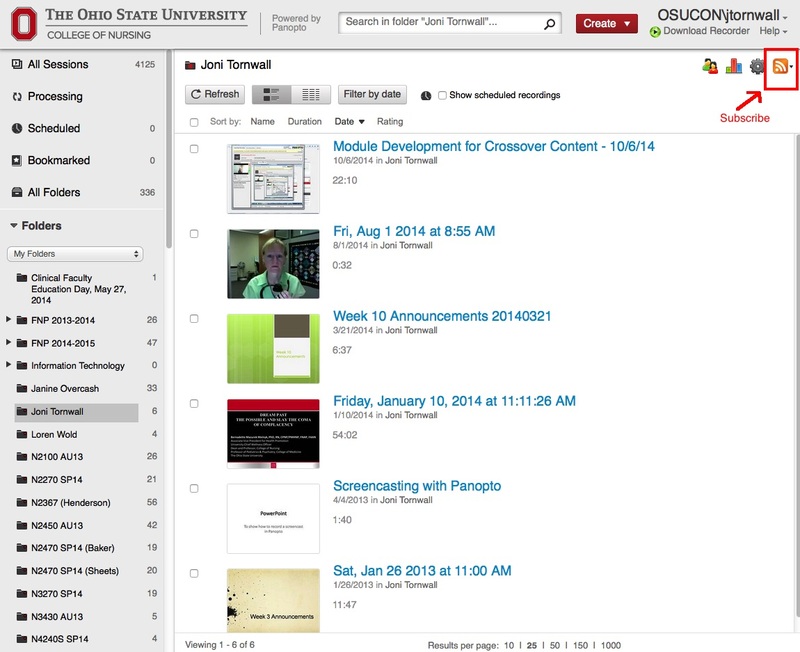 5) On the resulting page you will see a list of topics and files. 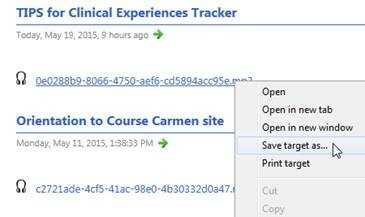 Right click and choose the “save as” option in your browser to download the file.